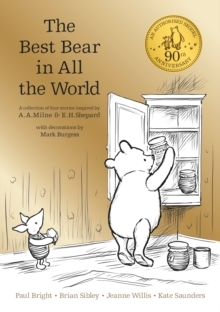 Celebrate 90 years of Winnie-the-Pooh with The Best Bear in all the World, the official sequel to the classic children's stories by A.A. Milne. With brand-new stories from some of the most beloved children's authors writing today: Paul Bright, Brian Sibley, Kate Saunders and Jeanne Willis - each will transport you back into the Hundred Acre Wood for more adventures with Winnie-the-Pooh, Christopher Robin, Piglet, Tigger, Eeyore and the rest of the gang. With decorations by Mark Burgess, in the style of the cherished illustrations by E.H. Shepard. This book will delight fans of the classic originals old and new. The short stories are perfect bedtime reading for ages six and up. Do you own all the classic Pooh titles?Winnie-the-PoohThe House at Pooh CornerWhen We Were Very YoungNow We Are SixThe nation's favourite teddy bear has been delighting generations of children for 90 years. Milne's classic children's stories - featuring Tigger, Piglet, Eeyore, Christopher Robin and, of course, Pooh himself - are both heart-warming and funny, teaching lessons of friendship and reflecting the power of a child's imagination like no other story before or since. Pooh ranks alongside other beloved characters such as Paddington Bear, and Peter Rabbit as an essential part of our literary heritage. Whether you're 5 or 55, Pooh is the bear for all ages.